Posted on August 4, 2013 by revivewa	in Travel and Spirituality. 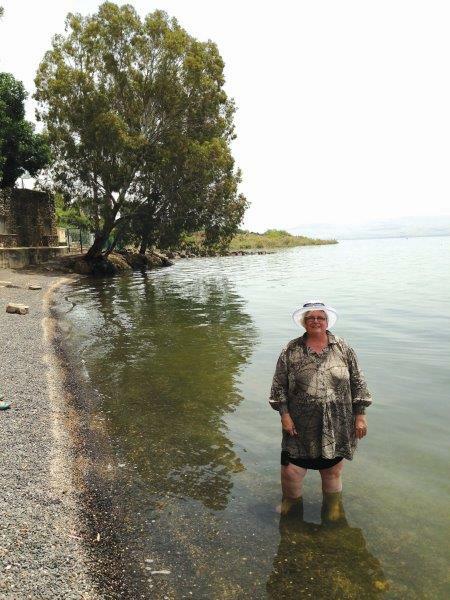 Jeni Goring wading in the sea of Galilee. When I told people I was going to the Holy Land, those who had already been there told me I would never be the same again. In Israel, I was where Jesus was – where he was born, walked, talked, taught, healed, preached, died and rose again. The experience was real and surreal: collapsing 2000 years of history from Jesus’ human life on this earth into 21st century Israel. After wanting to go to the Holy Land for such a long time, a friend told me about the Church Leaders’ Educational Tour of the Holy Land, a trip sponsored by Israel’s Ministry of Tourism. Our visit was arranged by The Israel Travel Centre in NSW and we were guided through Israel by Naftali Tours from 27 May to 4 June. We were looked after very well, especially with the usual overseas travel crises (for us a broken suitcase, and a broken tooth). You know, there is a road sign to Jericho? Looks just like the one to Kalgoorlie or Albany, but it is to Jericho. Stories and events from the Bible came alive as I breathed the air, drank the water, walked the ground and looked and gazed and watched. I was on a fishing boat, on the Sea of Galilee. Jesus had done this, in this very place. The sun was shining, the boat was gently rocking and I was praying. Our guide told us the geography of the surrounding hills causes strong winds to blow in without warning, and so it was easy to see how the situation got so bad so quickly that night when Jesus walked out to quiet the storm. The only storm this day was in my emotions. We docked near St Peter’s Primacy, a small church on the edge of the water, and I wept as I paddled in the Sea of Galilee with a eucalypt tree nearby, overwhelmed by a new revelation of the Christ who had lived in Israel but who now lives everywhere, even home in Australia where other eucalypts grow. A visit to Nazareth Village, the reconstruction of a first century village on an ancient agricultural site, gave us an insight into everyday life. After a talk by the educational centre staff, it was outside to experience the harsh reality of shepherding, grinding grain and grape crushing. After experiencing such a rustic and difficult way of life, it was bizarre to be in a mini bus speeding down a dual carriageway a few minutes later. To get to Bethlehem, we needed to go through ‘the wall’: a barrier built between Israel and the West Bank, or alternatively between Israel and Palestine, it depends on who you are speaking with. The whole concept of boundaries and borders is a foreign concept to me. Growing up in Australia, the only border is an ocean (though we still claim Tasmania and some other islands). And Australia is a big land. To be in such a small place fought over by so many people over so many centuries, it was hard to get my head around. One of the special times was celebrating the Eucharist in the ‘dell’ at the Garden Tomb. We were given a guided tour of the site by a prayerful and caring Englishwoman who obviously has a love for Jesus and that place. The volunteers at the site will set out bread and wine for any visitors who wish to have communion. And so we found ourselves in a beautiful shaded area, in quiet, resting in the story of Jesus’ burial and resurrection and sharing the story of that meal on his last night. Tourism is a major source of income for Israel’s economy, and so there are many sites of interest to Christian visitors. Some, like the Sea of Galilee, have a basis in scripture and geography. There are others, such as the Mount of the Beatitudes, where it is considered to be the most likely place Jesus preached this amazing sermon. Whatever its provenance, this is a place to visit. However, there are other places. I paddled at both the places Jesus was baptised by John in the Jordan. Yes, I know there is a theology that we only baptise once, but it seems that two different groups decided they knew just where John had done the baptism. What was incredible is the river is less than 10 metres wide at this point, and we were talking across the river with tourists in another country, as they were standing in the Kingdom of Jordan. Given we know nothing about the vast majority of Jesus’ life, I decided in the end that the importance of ‘here’ or ‘there’ is really not important. Jesus was baptised somewhere in the Jordan, he travelled around Israel, he died at Jerusalem and he rose again in glory. A trip to the Holy Land involves churches and monasteries, rivers and valleys, towns and ruins, and people. We met the most wonderful and unlikely people. We saw goat herders and cameleers, Bedouin camps, monuments, desert, sea, sand and synagogues. I found the experience breathtaking and challenging, affirming and exciting. And they were right; I will never be the same again. Rev Jeni Goring (Anglican), minister at St Peter Emmaus, a joint Anglican Uniting congregation.